In today’s data-driven market, well-structured and high performance organizations are increasingly relying on business intelligence to gain a competitive advantage. This allows them to respond quickly to market changes and align execution with overall strategic direction. As a company that understands Business Intelligence and SAP Solutions, GoodWorkLabs offers the most comprehensive services for SAP Business Intelligence (BI) product suite. These products facilitate in-depth analytics and visualization capabilities for business processes, and support increased profitability and enhanced enterprise performance. What can BI and GoodWorkLabs do for you? 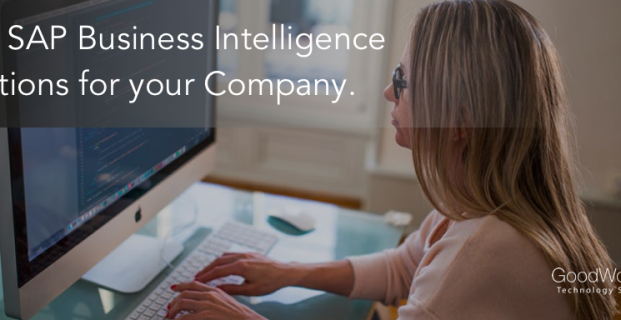 Achieve optimal information flow with a company-wide Business Intelligence strategy. Transform your BI application environment into a self-perpetuating ecosystem that delivers a measurable return on investment. Cover data quality, ETL frameworks, enterprise reporting, ad hoc and analysis reporting, and dashboards and visualization from any source system. Enterprise Performance Management solutions to evaluate the economic performance of your organization. Access a broader set of enterprise information, including ad hoc reporting, dashboard analytics, operational analytics, search and exploration, and compliance reporting. Analyze important factors and key performance indicators of your company success and draw the right conclusions for future decisions with the help of Predictive Intelligence. Our Data Management approach enables efficient data handling, coping with highest security standards and compliance regulations. SAP BI consolidates your data enterprise-wide into a single platform for better visibility, delivering unprecedented operational insight to support your business decisions. GoodWorkLabs provides the vision and strategy to get you there with SAP BI. It Enables users with anytime, anywhere access to key BI insights delivered in context. The Business Intelligence Platform provides fast, self-service access to decision-ready business intelligence. Track your key business parameters and drive through high growth paths with high-impact dashboards and BI applications that make your numbers easy to understand at a glance. With SAP’s state of the art and user-friendly BI tools, you can create mobile, highly interactive, role-based dashboards which bring trusted, aggregated data to business users in real time – anytime, anywhere. Our Business Intelligence team provides value-adding solutions which deliver information to the right place, at the right time, in the right format. By working with you and challenging your assumptions, we strive to be your long-term partner for intelligent reporting and planning solutions. We rely on our functional and technical expertise from 4 years of SAP consultancy to support you on all your individual matters with our value-adding custom BI solutions. In addition to our IT expertise, we also want to inspire our customers and facilitate the open and honest communication between the stakeholders involved to ensure a successful outcome. In practice, this means gaining the confidence and support of those stakeholders to implement new processes, new IT tools and to actively involve them in the project. We believe that user acceptance is crucial for a reporting or planning tool to deliver lasting value to an organisation. Experience gained through many years and a variety of projects makes us a reliable, honest partner. We provide support to you in all phases: the definition of a BI strategy, the design of a functional/ IT concept, system architecture, data modelling and complex programming through to finalized reports or dashboards and beyond. We aim to be your one-stop-shop for Business Intelligence solutions. Why Cloud Computing is the future of enterprise application platform? GoodWorkLabs is a new-age outsourced product development company with a core focus on Data Science, AI, and Machine Learning technologies. With an award-winning UI/UX design studio, we craft applications that are designed with beauty and utmost precision. All Rights Reserved. © GoodWorkLabs Services Pvt. Ltd.